This article is brief introdution about the basic CSS3 propertices and please note that CSS3 is under development. Now a days most popular browsers supports CSS3 except Internet Explorer lower versions, Use it and avoid images for round corners and shadow effects. The vendor specific prefixes are placed before a css property which indicates work-in-progress and the prefix is specific to the browser vendor. Each browser has their own prefix where other browsers will ignore them as they don’t recognize them. The basic property in CSS3 spec is border-radius. This property will helps in rounding the corners of an element. We can also declare all transition properties using a short-handed property. Great looking! But for me, complete with radius border, shadow and transition effect works only on Google Chrome. IE7 - none of these, Firefox - shadow, radius. 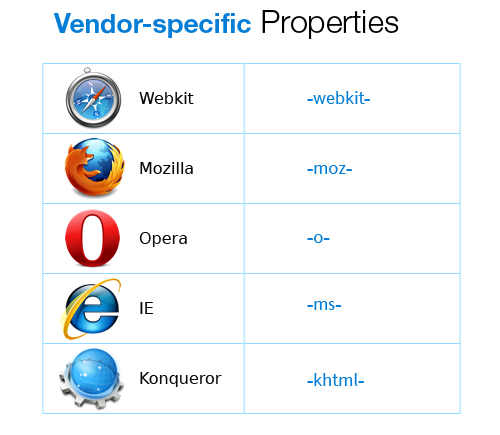 @nidzonni : IE9 Beta will support these. Opera 11 and IE9 accepts transition, border-radius properties directly without any prefixes..
it not working on IE 8 ! IE is way behind the times on CSS3. IE needs to push 9 out the door so all major browsers can support some of these newer and better features. Thank you for expressing your views. That article got me thinking. Wonderful article. A great find.What a great article. Thanks for sharing. Thank you for the wonderful article. Liked your post. Keep up the good work. All the best. if its not working in IE 7 or below..please use CSS3PIE.It makes Internet Explorer 6-9 capable of rendering several of the most useful CSS3 decoration features.